Sunshine Through the Rain: Why I do what I do! The lovely Mara from Secretly Stitching invited me to participate in the Around the World Blog Hop, and it has helped me reflect a little about this relatively new, but immensely important part of my life - sewing, quilting and blogging! Although I would like to work on one project at a time I get bored and restless too easily! I am currently working on two baby quilts that I am making as gifts - one is scrappy and came together very easily (you can see it here). The other has taken me many months of embroidery but I have finally started piecing the blocks and hopefully will have the top finished soon. 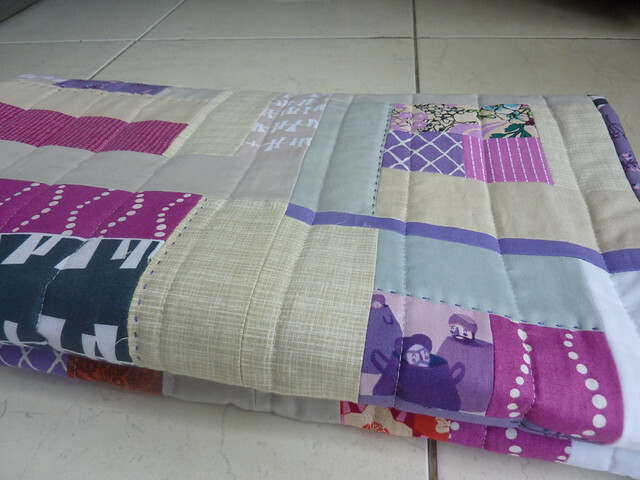 I have also just last week started to teach myself Free Motion Quilting. Ten minutes practice every day (following the #dailyfmq hashtag on instagram) has been a great motivation for me and I can already see a tiny bit of progress. Happily though I can sense that this is a part of quilting that I will really enjoy and I am loving a new challenge. I don't really think it does! 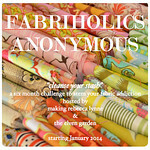 I follow a lot of sewing blogs and friends on instagram and pull so much inspiration from them. I like to use bright colours and love adding embroidery or hand quilting to add a personal touch to what I make. I am a bit of a perfectionist and try to finish off what I create as well as possible. I create because after 38 years of declaring myself a 'non-crafty person' I have finally found a creative side and a hobby that I can immerse myself in and enjoy. I create as a way of escaping from the harshness of life - as a means of relaxing and unwinding. I create because I love the joy that comes from creating for others - and I most easily express my love and appreciation of others by giving them home-made gifts. I write as a way of contributing to the blogging community where I have made many friends - I love that I can connect so easily and readily with friends around the world who share my love for fabric and sewing. I usually come up with who I want to make a gift for first, then search around until I find a pattern or idea that I think they will love. My favourite part is then choosing the fabric before I sew it together. Thanks for reading. Next week I have asked Jess from The Elven Garden to share with us. Jess is one of my favourite quilters. 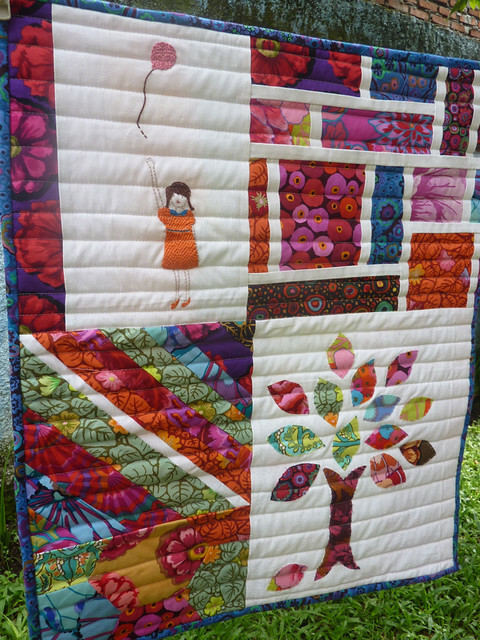 I cannot believe the awesome quilting she does on her home machine, and I love her style of improvised piecing. She is also really down-to-earth and has an obvious love for creating beautiful things. Thanks Jess! Beautiful, love it! It is so fun making gifts for others, I think that is my favorite part about this "hobby". Nice to read a bit more about your thoughts. Great photos too! It is so nice to learn about you and your creative process. All of your projects are beautiful, but I'm particularly taken by the blocks with the embroider centers. it is going to be a very special quit. You have a real knack for combining your fabrics well and I love the handmade touch your hand stitching adds to a project. So pleased you have found a constructive creative outlet which also adds much to your quality of life too. 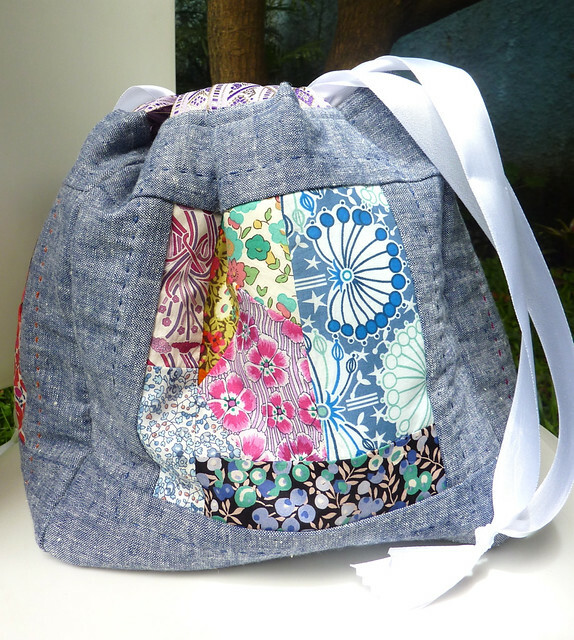 Love how important giving handmade presents is for you and how use chose a project and fabrics with the person in mind. Makes your projects extra special. Great post and beautiful photos. It was nice getting to know you better. You are right: there is something special about home-made gifts. The embroidered baby quilt will be something really lovely. It's great to hear about your creative process and to see your lovely projects. I love how you include emboidery. Love the little girl and the balloon! I'm a multi-project person too! Beautiful work, I love your embroidery particularly. Is it hand embroidery or machine? 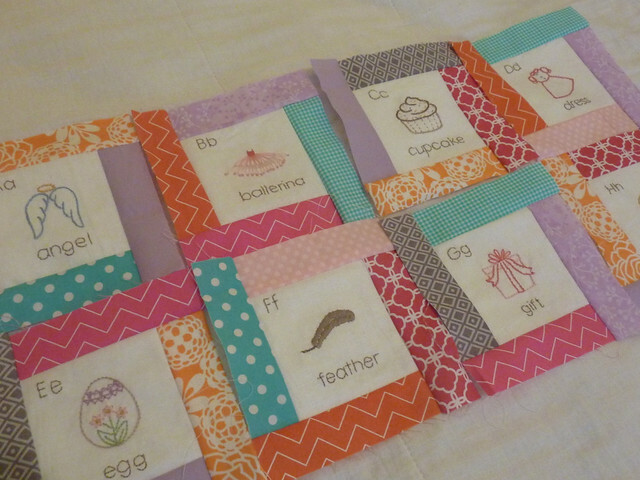 Your alphabet baby quilt is going to be really special. you are such a kind soul, with a giving heart and gentle touch. it comes through in your pictures, your creations, your words. i'm blessed to call you friend.